Intermediate Level - You Can Learn IET! 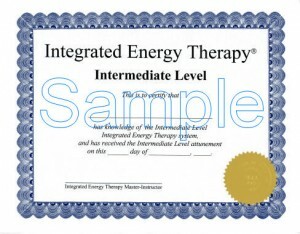 Prerequisites: Completion of the Integrated Energy Therapy® Basic Level class is required for attendance at this class. Description: This class is the next step in our Integrated Energy Therapy® training system and it builds on all of the knowledge and techniques learned in our Basic Level training. Our Intermediate Level training expands upon both the depth and the breadth of the Basic Level techniques through the Intermediate Attunement (which opens you to clear mental and karmic imprints) and through the special Integrated Energy Therapy® pullout-release technique that lets you clear imprints from the human energy field. Only IET Master-Instructors are authorized to teach this class. Intermediate Entire Class: As a stand-alone complete one-day class. Intermediate level certificate given upon completion. 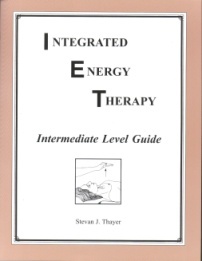 Class Materials: You will receive a fully illustrated 26 page Integrated Energy Therapy® Intermediate Level Guide and an official Integrated Energy Therapy® Intermediate Level Certificate. To see Intermediate level classes that are currently scheduled, click HERE.